RNA Binding to CBP Stimulates Histone Acetylation and Transcription. In our most recent paper, we showed how RNA binding to CBP could modulate CBPs enzymatic activity to control histone acetylation and gene expression. The model explains how localised transcription of eRNAs could tailor the activity of sub-populations of CBP bound at enhancers, leading to functional diversity in enhancer activity. Daniel Bose, Tillmann Pape, Patricia C. Burrows, Mathieu Rappas, Sivaramesh Wigneshweraraj, Martin Buck, and Xiaodong Zhang. Molecular Cell, 32 (3), 337-46 (2008). PMID 18995832. 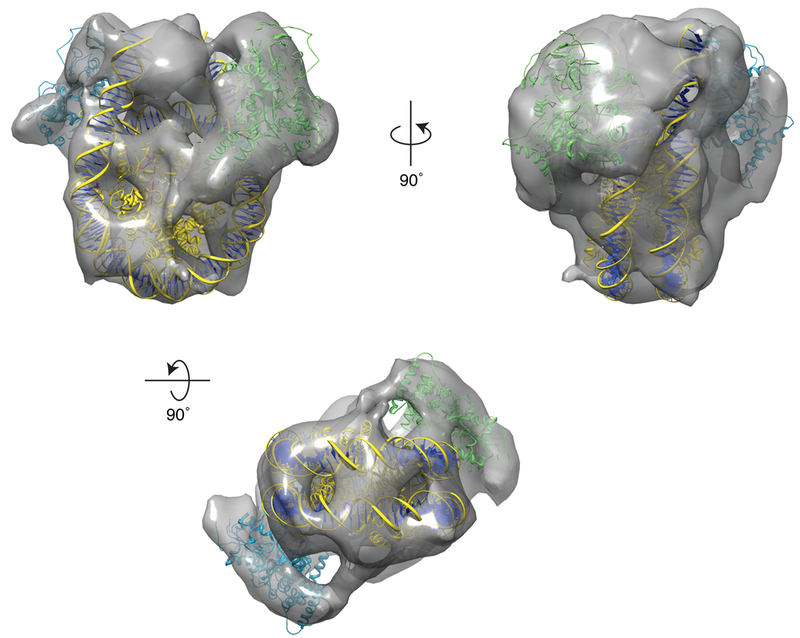 Part of a long-running collaboration with Prof. Martin Buck FRS, we used cryo-EM to describe the mechanism of the alternate sigma factor, sigma-54, in bacteria. When bound to RNA polymerase (RNAP), Sigma-54 needs to interact with a special activator protein bound at a distal enhancer-like element to initiate transcription. These activators use energy from ATP hydrolysis to re-model RNAP/sigma-54 to initiate transcription, a process that we visualised for the first time. Brianna J. Klein*, Daniel Bose*, Kevin J. Baker, Zahirah M. Yusoff, Xiaodong Zhang, and Katsuhiko S. Murakami. Proc Natl Acad Sci USA, 108 (2), 546-50 (2011). PMID 21187417. In collaboration with Katsuhiko Murakami at Penn State, we produced the first structural description of how the Spt4/5 transcription elongation factor interacts with RNA polymerase. Matheshwaran Saravanan*, Jochen Wuerges*, Daniel Bose*, Elizabeth A. McCormack, Nicola J. Cook, Xiaodong Zhang and Dale B. Wigley. PNAS, 109 (51), 20883-8 (2012), PMID 23213201. In collaboration with Prof. Dale Wigley FRS, we carried out structural and functional characterisations of the INO80 chromatin re-modelling complex, including the actin-relate protein Arp 8 bound to a nucleosome, an early structure of nucleosome-bound proteins solved using cryo-EM. Non-coding RNA: More uses for genomic junk. How do lncRNAs regulate transcription? Sawicka M., Wanrooij P.H., Darbari V.C., Tannous E., Hailemariam S., Daniel Bose, Makarova A.V., Burgers P.M., Xiaodong Zhang. The dimeric architecture of checkpoint kinases Mec1ATR and Tel1ATM reveal a common structural organisation, J Biol Chem, 291 (26), 13436-13447 (2016), PMID 27129217. Matheshwaran Saravanan*, Jochen Wuerges*, Daniel Bose*, Elizabeth A. McCormack, Nicola J. Cook, Xiaodong Zhang and Dale B. Wigley. Functional role for an Arp8 dimer within the INO80 Chromatin Remodelling Complex, PNAS, 109 (51), 20883-8 (2012), PMID 23213201. Milija Jovanovic, Patricia C. Burrows, Daniel Bose, Beatriz Cámara, Simone Wiesler, Xiaodong Zhang, Sivaramesh Wigneshweraraj, Robert O J Weinzierl, Martin Buck. Activity map of the Escherichia coli RNA polymerase bridge helix, J Biol Chem, 286 (16) 14469-79 (2011), PMID 21357417. Brianna J. Klein*, Daniel Bose*, Kevin J. Baker, Zahirah M. Yusoff, Xiaodong Zhang, and Katsuhiko S. Murakami. Structure of the cellular RNA polymerase and transcription elongation complex, Proc Natl Acad Sci USA, 108 (2), 546-50 (2011). PMID 21187417. Daniel Bose, Tillmann Pape, Patricia C. Burrows, Mathieu Rappas, Sivaramesh Wigneshweraraj, Martin Buck, and Xiaodong Zhang. Organisation of an activator bound RNA polymerase holoenzyme, Molecular Cell, 32 (3), 337-46 (2008). PMID 18995832. Tamaswati Ghosh, Daniel Bose and Xiaodong Zhang. Mechanisms for activating bacterial RNA polymerase, FEMS microbiology reviews 34 (5), 611-27 (2010), PMID 20629756. Patricia C. Burrows, Sivaramesh Wigneshweraraj, Daniel Bose, Nicolas Joly, Jorg Schumacher, Mathieu Rappas, Tillmann Pape, Peter Stockley, Xiaodong Zhang and Martin Buck. Visualizing the organization and reorganization of transcription complexes for gene expression. Biochem Soc Trans. 36, 776-9 (2008). PMID 18631157. Daniel Bose, Nicolas Joly, Tillmann Pape, Mathieu Rappas, Jorg Schumacher, Martin Buck, and Xiaodong Zhang. Dissecting the ATP hydrolysis pathway of bacterial enhancer binding proteins. Biochem Soc Trans. (36), 83-8 (2008). PMID 18208391. Sivaramesh Wigneshweraraj, Daniel Bose, Patricia C. Burrows, Nicolas Joly, Schumacher, Mathieu Rappas, Tillmann Pape, Xiaodong Zhang, Peter Stockley, Konstantin Severinov, Martin Buck. Modus Operandi of a unique bacterial RNA polymerase class. Molecular Microbiology. 68 (3), 538-46 (2008). PMID 18331472. Mathieu Rappas, Daniel Bose and Xiaodong Zhang. Bacterial Enhancer-Binding Proteins: unlocking 54 dependent gene transcription. Curr Opinion Struct Biol. 7, 110-6 (2007). PMID 17157497. Martin Buck, Daniel Bose, Patricia C. Burrows, Wendy Cannon, Nicolas Joly, Tillmann Pape, Mathieu Rappas, Jorg Schumacher, Sivaramesh Wigneshweraraj, Xiaodong Zhang. A second paradigm for gene activation in bacteria. Biochem Soc Trans. 34, 1067-71 (2006). PMID 17073752.